Splendid Gentlemen, covers band for weddings and special events. They are a three- piece dynamic live band playing a selection of the very best pop & rock music. 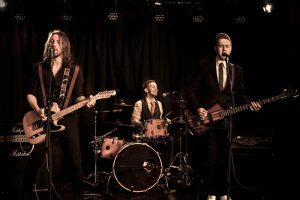 Nothing like the usual, cheesy wedding band, Splendid Gentlemen is a fresh, contemporary band from Glasgow, Scotland. Awarded the 2016 Confetti Award for Best Evening Entertainer, Splendid Gentlemen pride themselves on doing things a little differently. Having an extensive set list is where a wedding band really makes it’s mark. This band has a list of songs that is a constantly expanding body of work where they try to encompass all the wedding standards you would expect from a Wedding Band. The band has tried to cover as many genres and styles as they can, from 1950’s right up to current chart songs, but also aim to make it a priority to have a list of songs that you wouldn’t expect to have at your wedding from an ordinary band. but then this is no ordinary band! Splendid Gentlemen evolved from a pub band playing classic rock tracks, and ever since have tried to keep that ethos throughout their development into one of the finest bands playing in Scotland today. The band play plenty of alternative songs from Foo Fighters, Blink 182, Metallica and AC/DC should you wish them played at your wedding. The band started in 2010 evolving from other bands After 6 months of rehearsals to build up a bank of songs and find a sound on their own, Splendid Gentlemen played their first gig in The Scotia Bar in February of 2011. After the gig one guy said, “That’s the best band I’ve seen since Aerosmith!” which was agreed was a pretty good start. Never one to back from a challenge the wedding was played, and from that came more wedding bookings. The band over the years adapted to suit the needs of the difference between a wedding and a pub gig, but never lost that ‘band’ mentality. This ‘Band that plays weddings’ rather than a ‘Wedding Band’ model has proved to be extremely popular with many people who didn’t think the cheesy, ‘Wedding Band’ was right for their wedding finding our humble services fit perfectly with that they had dreamed their wedding day could be. Splendid Gentlemen continues to grow in popularity and offer something completely different. Book Splendid Gentlemen for your wedding.